In 1995, Nonin Medical revolutionized pulse oximetry by inventing the world's first finger pulse oximeter, the Onyx 9500. Today, Nonin's latest finger pulse oximeter for health care professionals, the Onyx® Vantage 9590, provides a fast, accurate, cost-effective solution for spot-checking oxygen saturation and pulse rate in pediatric to adult patients. Available in four colors – black, red, blue and purple. 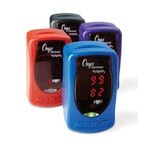 -The Onyx is the only finger pulse oximeter with scientifically proven accuracy and is tested for use on fingers, thumbs and toes. -Proven Accuracy : Scientifically proven accuracy in the widest range of patients. -Reliable Results : Accurate readings on challenging patients due to low perfusion and darker skin tones. -Tested in motion. -Versatile : Units work on pediatric to larger adult patients and can be used on fingers, thumbs or toes. -Cost Efficient : 4-year warranty and up to 6,000 spot checks on two AAA batteries.